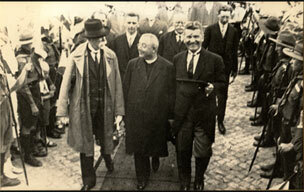 The Reverend Bown pursuaded Tomas Bata to build his factory in East Tilbury. re Rev W Chas Bown at BRRC we have another picture taken in Zlin in 1928. Also i believe he had 3 sons serving in WW2, according to Bata Record 1942 one lost his life during the evacuation of Crete. Also one was married in 1942 and one captured in Dunkirk. is not the rev in question Rev Bown ? (Thanks for letting us know about this typo – I have corrected the name.